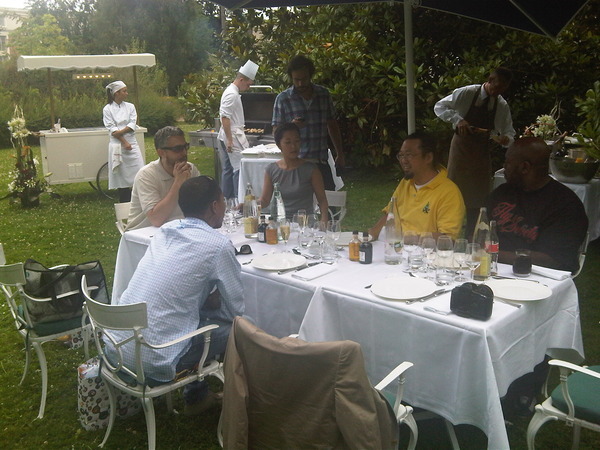 We saw this image that claimed to be of Takashi Murakami and Pharrell having dinner in Versailles, France in July and didn’t think much of it (perhaps they were talking about their collaboration sculpture with Jacob the Jeweler at Art Basel Switzerland). Turns out there was more to it than meets the eye when it was announced this morning that Murakami will be exhibiting at the famed Palace of Versailles in France. Sounds like eight massive works have been installed. It’s a whirlwind of a week for the Superflat guru as he’s also hitting up New York’s Gagosian and Paris’ Emmanuel Perrotin (previewed) for solo shows as well. Time will tell if it will be as controversial (probably not) as Koons show there a while back, although it did draw record numbers. Tip off by Art Observed. Image via Staceyy. Categories: Art, Contemporary Art, Shows & Events. Tags: Contemporary Art, Shows & Events, Takashi Murakami.